An OCFA fire crew and SAPD police officers found a body inside a burning car parked on a driveway of a Santa Ana home at the 900 block of South Hickory Street at about 7:30 a.m. this Friday morning, July 13, according to the O.C. Register. How many people have to die on Santa Ana’s streets? Jimmy was a black homeless man who stayed near Warner and Bristol and was often seen in a wheelchair. He had been around this area for some time and many knew him. 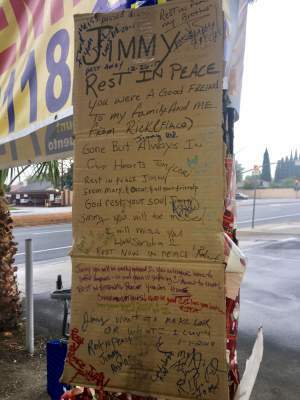 Unfortunately, he lost his life on December 26th near the shopping center at Warner and Pacific. (Santa Ana) – A new study by the Orange County Health Care Agency examines the leading causes of premature death in Orange County residents. Over 6,000 deaths in 2010 were premature – people less than 75 years of age. The three leading causes of premature death were cancer, heart disease, and unintentional injury (primarily drug overdose). Advisory: SAPD Homicide Detectives investigating suspicious circumstances death 1300 Block North Harbor Blvd. On 5-28-2014 at approximately 1:20 AM, Santa Ana patrol officers responded to the apartment complex located in the 1300 block of North Harbor Blvd. Deceased former Republican Party of Orange County Chairman Tom Fuentes “scripted his funeral ritual last August with one of his former seminary classmates and refined it in the intervening months,” according to his longtime friend, O.C. Register columnist Frank Mickadeit.